Entertaining at home doesn’t have to mean hours in the kitchen. Put together a selection of delicious foods, arrange them stylishly on a platter or board and let guests graze at their own pace. This is relaxed food you can whip up after work or during a busy weekend. 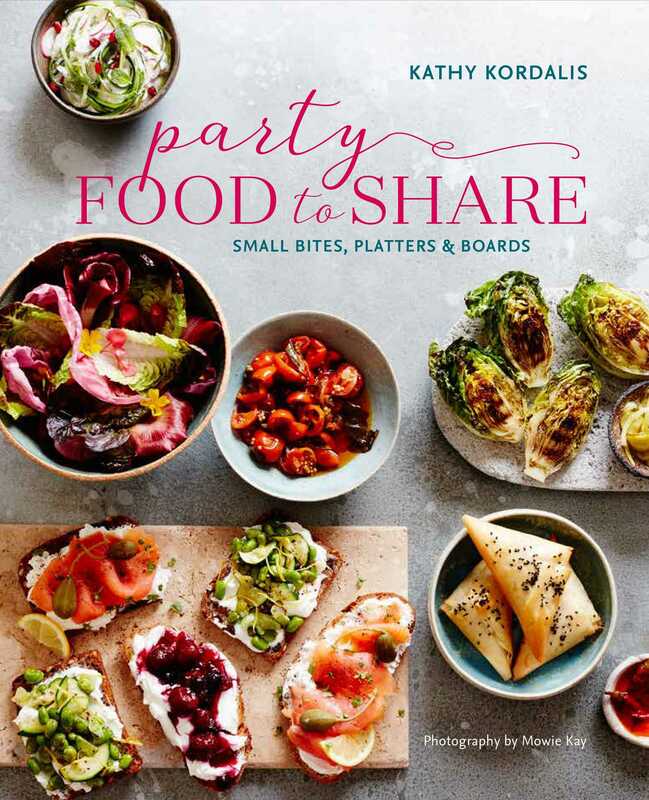 Kathy Kordalis offers inspired ideas for creating perfect platters to share at home, whether you are serving brunch, lunch, dinner, nibbles with drinks, or a feast for a crowd. Within each sharing menu there are lists of things to buy in (such as fresh vegetable produce, bread, cured meats, and cheeses) dishes that require simple preparation, (salads and pickles), plus exciting recipes to cook. In Autumn, reflect the bounty of the harvest with platters that include seasonal treats like squash, chard, beets, and purple artichokes. Winter is a time for comfort food at its finest. It's dark, it's cold, it's probably raining. The only antidote is a cosy home and a dining table groaning with delicious things for your friends to help themselves to. Serve comforting spiced tomato soup with cheese scones, a good old-fashioned beef stroganoff and chile chocolate mousse in espresso cups. Come Spring it’s time to lighten up. Young vegetables with tangy dips, small bowls of pea and mint risotto, artichokes with the perfect vinaigrette, and herb-garnished gin and tonics. Let it shine in Summer. Head outdoors and entertain in style with fun barbecue sharing platters, seafood and dazzling dessert stations for al fresco fun. Finally, embrace the art of feasting, whether cooking a sensual dinner for Valentine’s Day or celebrating a special event. Make up these platters or tables of food when you have more time to spend in the kitchen and serve a stunning centrepiece rib of beef or a classic whole salmon served with sumptuous sides. Ultimately, it’s all about spending time with your guests and enjoying yourself.